Would you like to add more integration options to your forms? With Zapier, a connector service, you can easily connect your forms to numerous web applications to add even more functionality. 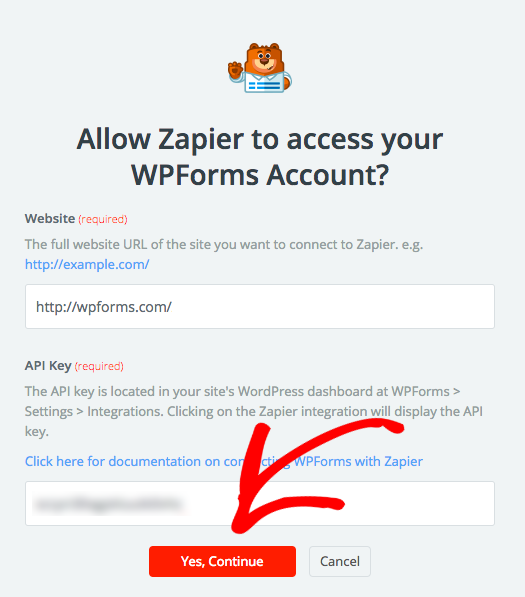 In this tutorial, we’ll show you how to install and use the Zapier addon for WPForms. Requirements: You will need a Pro license level or higher to access the Zapier addon. Before we get started, be sure you have installed and activated WPForms. Then, you can go ahead and install the Zapier addon. 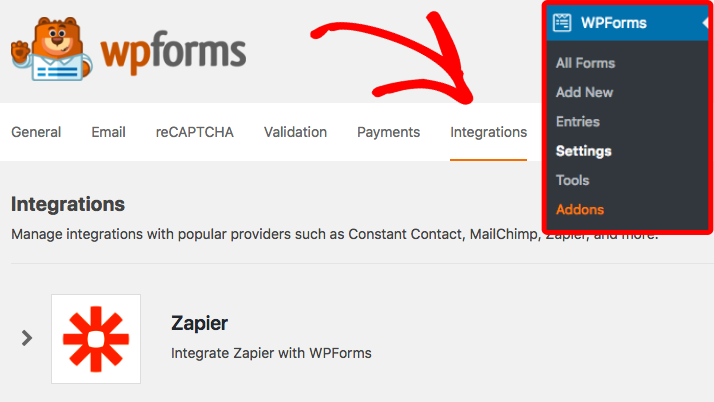 Once the Zapier addon is activated, you’ll need to go to WPForms » Settings and then click on the Integrations tab. Within this tab, you’ll see a Zapier option. Go ahead and click it to open more details. This is where you’ll find the Zapier API key for your site. Be sure to keep this browser tab/window open, as you’ll need this API key in the next section. 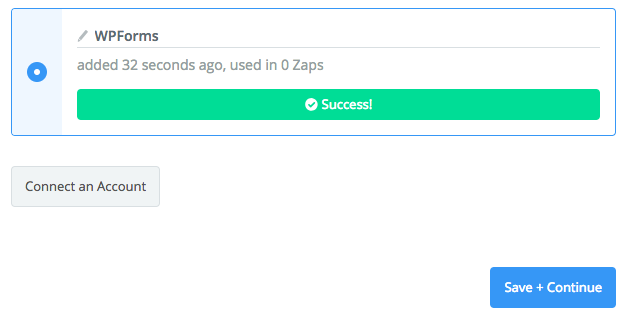 In Zapier, the integrations you create are called “zaps”. The next setup step is to create a zap that sends information from your forms to another service. First, you’ll need to log into your Zapier account to Zapier website. If you do not have an account yet, then you can sign up and create an account for free. Note: Some integrations will require a paid account with Zapier. For more details on identifying paid integrations, please see Zapier’s page on premium features. After you’ve logged into your account, you’ll need to click the red button labeled Make a Zap in the upper right corner. This will open the setup page for your new zap. If you’d like to name your zap, go ahead and add a name in the upper left corner of the page. Next, you’ll need to select WPForms as the Trigger App. Within the Choose a Trigger App search box, type WPForms. Then click WPForms within the results that appear. 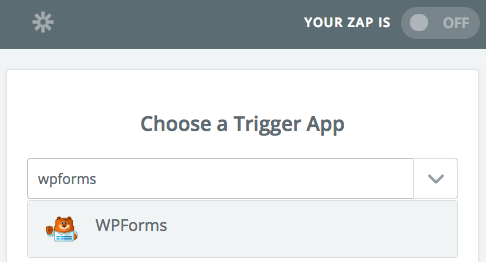 Once you’ve selected WPForms, Zapier will display your trigger options. 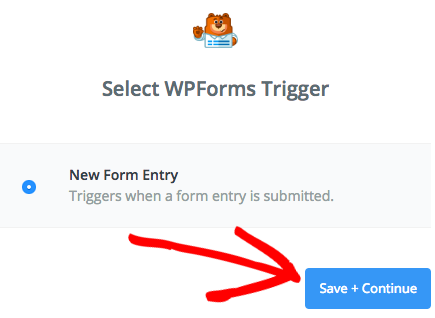 Since WPForms only has one trigger option (“New Form Entry”), you can simply click the Save + Continue button to proceed. 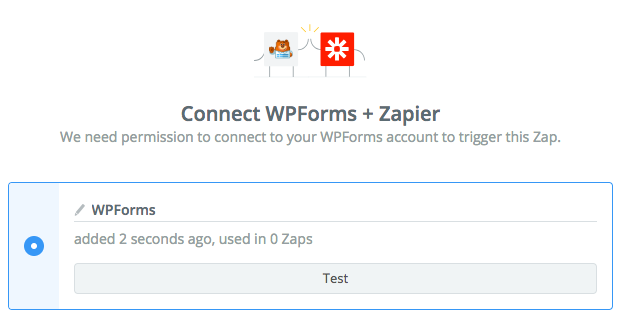 In the next step, you’ll connect Zapier to WPForms on your website. To do this, click the Connect an Account button. This will cause an overlay to appear. Here, you’ll need to fill out the Website field. Be sure to enter the full URL of your website and include the trailing slash (ie: http://example.com/). Then you’ll need to add your API Key. To find your API key, go back to the tab/window where you kept your WPForms Settings open in our first step. Then copy and paste the key here. When you’re ready, click the Yes, Continue button. This will connect Zapier to your website. To be sure the connection is working, though, we recommend clicking the Test button. After a few moments, you should see a green Success! message. Once this appears, click the Save + Continue button. On the next screen, you’ll need to select the form you’d like to use in this zap. Zapier will automatically pull a list of all forms on your site within the Form dropdown. After choosing the form you want, click the Continue button. For the next step, Zapier will give you a chance to pull in sample entries. We recommend doing this, as you’ll be able to see exactly how your zap will work and feel confident that the integration is fully functional. However, this step is optional. After proceeding through the sample entries steps, Zapier will ask you to Choose an Action App. The Action App is the service you wish to send your form entry details to. There are over 500+ apps/services available so the possibilities feel almost limitless. After selecting an Action App, Zapier will walk you through steps to pass form entry data to your chosen service. The steps remaining will depend on the service you integrate with. For specific tutorials on the most popular Action Apps for WPForms, please continue to the next section. Since the next steps will vary depending on the Action App you choose in Zapier, we aren’t able to cover all possible options in a single tutorial. For detailed guides on our most popular Zapier integrations, please check out the articles below. That’s it! You can now connect your forms to hundreds of additional web services through the Zapier addon in WPForms. 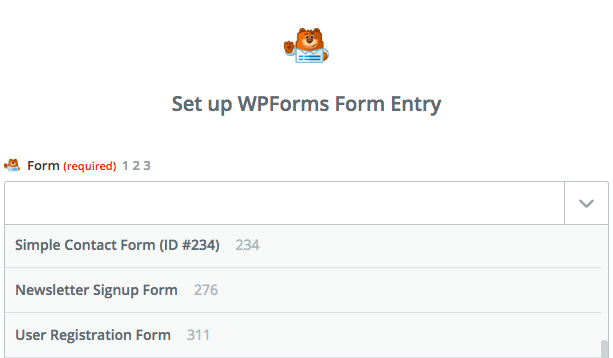 Next, would you like to learn more about what you can do with WPForms entries? Be sure to check out our complete guide to entries for details on all of the available options and tools. Fixed: Entry ID not correctly passing to Zaps. Fixed: Empty Checkbox field choice labels causing PHP error.